The law of Orlah pertains to the land of Israel and the Diaspora, and simply put means that after planting the vine (or any other fruit bearing tree), you are not allowed to make use of the fruit that grows for the first three years. A partial value of the fruit from the fourth year is redeemed unto a coin, like that of Masaser and Terumah explained below, and then the fruit is fine to consume. The fruit of the fifth year and on is free of any issues, other than the issues listed below, Shmita, Termuah, and Maaser. On an aside, this is a practice that is followed for non-ritual reasons by many quality vineyards where the producers simply understand that immature grapevines don’t make the best wine. The law of Shmita is rather complex and thankfully only pertains to the land of Israel. However, being that Israel is either the largest or close to the largest producer of Kosher Wine in the world, it causes an issue every seven years. You see, the law of Shmita states that every 7th year, you will not sow or help grow anything in the land of Israel. Being that Israel has been a land of Agriculture since its upbringing, that pretty much means that Jews in Israel are at a competitive disadvantage every 7 years to the rest of the agricultural world. Imagine trying to keep a long-term agriculture contract with a McDonald or Kraft food knowing that every 7 years they will need to go find another supplier! Still God put it as one of the essential laws of the land of Israel, and one that Jews have been trying to work around since its very initiation. Kosher wine from Israel is an exploding business, and a large part of that business is selling the wine to the Diaspora – up to 25% for some wineries, and for other wineries that number is even higher. The problem is that the American Kosher supervisory organizations is some do not approve of kosher wines from Israel produced during a shmita year. So that means that the importers of these wines have two choices, either skip the 2001 and 2008 vintages (the past two Shmita years) or import the wine without any visible kosher symbol that an American Jew would understand. There are of course Israeli kosher supervisory organizations on the bottle/label, but not ones that anyone in Brooklyn, Los Angeles, or Chicago would know. On an aside, and a clear proof that God has a great sense of humor, the 2001 and 2008 vintages are two of the best vintages to come out of Israel in its nascent wine history! Recently, we have seen many wines from Israel’s 2008 vintage hitting our shores, how can they sell them here? That goes to the matter of the two loopholes that are being used in Israel to manufacture Shmita wines, and any fruit for that matter. There is the simple and direct – Heter Mechira, translated to permissible selling. Put simply, the winery sells the vineyard or orchard to a non-Jew and buys the fruit back from him/her, and then at the end of the year, buys the orchard or vineyard back. Yes, a clear loophole around the ancient law, but one that was done for a multitude of reasons. Still, many in the Orthodox communities of Israel do not make use of this loophole. For those of you at home who are counting; the esteemed Yoda would respond, “No, there is another”, it is called Otzar Beit Din, loosely translated as Treasure/Auspices of a rabbinical court. It is the system of record for the majority of Orthodox Jews in Israel, and has been in use dating as far back as the Talmudic times (some 2000+ years ago). Under an Otzar Beit Din, a community rabbinical court supervises harvesting by hiring workers to harvest, store, and distribute food to the community. Members of the community pay the rabbinical court, but this payment represents only a contribution for services, and not a purchase or sale of the food. Still, while the Jews in Israel accept it, the OK, OU and other in the Diaspora do not. A logical question that one may ask is; why would an Israeli Orthodox supervisory organization accept Otzar Beit Din but not an American kosher supervisory organization? The answer is far too complex to fit in this article, but suffice it to say that without accepting this loophole the almost 1 million orthodox Jews in Israel would be without fruits and vegetables throughout the year. Sure one could buy all the fruits and vegetables from Israel’s non-Jewish neighbors and the rest of the world, but that would cause huge spikes in the cost of food and just add to the tension in the area. This is NOT a concern here in the Diaspora, as stated previously, so the loophole is not as accepted in America. In no way is this quick answer a slight to the shmita law, again, the subject matter it is far more complex than what could fit in this post or this entire web site. Rather, it is a boiled down reality of our times and nothing more than that. What we are left with is wines being produced in Israel during the Shmita years using either Heter Mechira or Otzar Beit Din, all of them without an American known supervision, and yet they are making their way to the Diaspora shores. I have been to kosher stores all around America, and barring a few, none of them call out the fact that the wine has NO American supervision on them. Some wine stores are better than others, but the vast majority of them state nothing, and when I bring up the issue, they are shocked themselves! To be fair the importers find themselves in a unique situation. Wine shops and kosher supermarkets want kosher wine, and the 2008 vintage happens to be a very good one. Royal Wines, owner of Herzog Cellars, and largest importer of Israeli wine, does not import ANY wines from the 2008 vintage. Instead they focus on filling the Diaspora’s need with the 2007 and 2009 vintages. The aspect of this conundrum that is a real concern is the label. The bottles have no American kosher supervision and the yet the bottle labels have not been updated to notify the American kosher consumer of this potential issue. If the consumer wants to buy a bottle of imported Shmita wine, they get no technical cue from the label. It is the same label they have seen gracing the wine they like for years. In the end it is up to the consumer to decide whether or not they think the existing supervision is sufficient, yet, on the average, the label, bottle, store, or importer is not notifying them. Personally, I drink Shmita wine that is produced under the auspices of Otzar Beit Din, such as wines from Yarden and Dalton, while some of my friends and acquaintances do not. Yet others drink any Shmita wine. I recommend that you ask your local area Rabbi for the correct direction that you and your family should be taking. If we have not lost you all yet, I am sure this one will do the trick! Maaser and Terumah, during ancient times, were systems of tithing, charity, and giving to the poor, all baked into an agricultural economic system. Now a days, it is handled by the kosher authorities and is nothing more than a formality that needs to be done, but does not affect the vineyard or the wineries in any way. The fruit that would have gone to the poor, Levites, or Priests (Cohen), are transferred to a separate financial instrument, coin in our times, and the fruit is free to be used. This transfer mechanism is cited in the Torah and the Talmud, and was used by large industrial companies, or by landowners with too much fruit to transfer by hand or in-person. Most of the issues revolving around wine additives lead to the religious address known as Passover, with a couple leading to far more murky and scary locales! Wine can be Kosher to drink while still not being Kosher for Passover. The inverse is impossible, as Kosher for Passover wines are innately kosher all year round. Passover is a more complex Jewish problem because of two reasons. The first one is that on Passover Jews cannot “own” leavened products, or leavening agents that are sourced from the five grains (wheat, spelt, barley, rye, and oat). This may seem unimportant to many of us, but as we will see soon, it matters greatly to the kosher wine makers. The second problem is far more encompassing and the one that I believe garners it the bogeyman award – Kitniyos. This law states that food substances that look like the five grains and from which leavening can occur think rice, corn, lentils, beans, and such, are not to be consumed on Passover. Again, many would not even give more than a moment’s thought on this subject, but they would be deadly wrong, as they have forgotten about the all mighty maize (aka corn). You see corn and corn syrup has become the new legal crack of our generation. It has been dumped into anything and everything that needs a flavor or sweetness boost. Why? What was so wrong with sugar? The answer is the other crack that drives our country, the all mighty dollar (though not so mighty now a days). For now corn syrup continues to be less expensive than sugar, and so it continues to drive the food business. Except that the vast majority of Jews in America do not eat corn for eight days each year, while the Sephardic Jews bask in the light of rice, corn, and quinoa, as they never took on this stringency. Armed with this information, one can quickly deduce that if they want to make a wine that is consumable for all Jews all year round, they need to do a bit more work to get around the extra Passover laws. Do not forget that the majority of ALL kosher wine sold in this country happens before the Jewish New Year and Passover. This is why most kosher wine happens to also be kosher for Passover. Of all the ingredients listed above, the one that should leap out at you is – yeast, as it is the definition of a leavening agent. To fix this problem people created Kosher for Passover yeasts and yeast nutrients (sourced from the yeast walls); they just cost more, like all Passover products. The next problematic ingredient is the Acid Blends. They are most often a combination of Tartaric Acid, Citric Acid, and Malic Acid. Until recently it was hard to get kosher Tartaric acid given the way it is produced, but that seems to be easier now. Citric acid has Passover issues, given that it can be extracted from corn. Finally, Malic acid seems to be available. Sugar is OK if you use sugar! Liquid tannin turns out to be easy to get in kosher format as well. Finally, the fining agents are a serious kosher problem! Bentonite and egg whites are the simplest way to go for kosher wines, while also being a fine pairing, as they are polar opposites. All the other options are either not kosher or questionably kosher because of the manner they are produced. NOTE: There are a few wines that add in corn syrup and the like, and are of course NOT Kosher for Passover. For example a few of the Manischewitz wines are not kosher for Passover, along with a few other wineries. So please CHECK the bottle for an OU-P or an OK-P before you use it on Passover. Come on, did you really think you would make it through a Kosher wine article without bringing up the proverbial Manischewitz wine company? Ask most people about kosher wine and this is what they will always come back to – the wine making process. So what are the issues involved in wine making? Essentially everything. Wine making is a science for sure, but it is just as much part art. From the moment the grapes are brought to the winery’s premises, only Orthodox Sabbath observant Jews can touch the must, juice, wine, barrels, open bottles, etc. This can get complicated and can be painful, especially when the wine maker or owners are not Jewish or Orthodox Jews. However, invariably, throughout my travels to kosher wineries around the world, I hear the same story to a tee. The Rabbis and Orthodox supervisors are an integral part of the winery. They clean the vats, they crush the grapes, they press the must, they stabilize the wine, they pump it into vats or into barrels, they rack the wine, they do everything that involves wine – period! Essentially, they are the winery, so what is the problem with that? Some non-kosher wineries in Israel explain that they need to be able to touch the wine, feel it, and taste it, so that they can make the best wine possible. The funny thing is that there are MANY wonderful kosher wineries where the wine maker is not only not Orthodox, they are not even Jewish, and yet the winery continues to pump out world-class wine. Victor Schoenfeld is a world-class wine maker for the best kosher winery in Israel; Yarden Winery, and yet he does not touch the wine. How can that be? Simple, when he wants to taste some wine from a barrel, he asks the mashgiach (Orthodox supervisory personnel) to get him some. This is not a complex issue. The personnel that interacts with the wine are Orthodox Jews, and are always around to get some wine from a barrel or vat, and setup the tastings for the wine makers. To be fair, a second work hand that is also Orthodox comes at an expense for a sole proprietor (boutique) winery. It is for this reason that small wineries in Israel with a single proprietor / wine maker / cellar rat, who is not Orthodox, will not make kosher wine. As the winery grows and adds more hands to handle the larger bottle production, it has a decision to make. Should the Israeli winery add a kosher supervision or not? The numbers of hands, above the owner or proprietor, do not change; they just get exchanged with Orthodox workers. What does change is the extra cost of the kosher supervision. Do not think for a moment that kosher supervision of ANY sort is free. In the end if a winery anywhere in the world becomes kosher, it is a business decision, unless the proprietor is already and Orthodox Jew himself, and even then there is still the cost of the oversight from the supervisory organization. So where does this thing called Mevushal come from? Loosely translated, it means boiled. Simply put, it allows anyone to touch the wine after it has been boiled or flash pasteurized. However, it is NOT required to make a wine Kosher and it CANNOT make a non-Kosher wine Kosher. So what can it do? It can allow the non-Jewish wine maker to enter the barrel room, open a barrel, and get a sample of wine out for a tasting, after it has gone through the mevushal process. It can also allow the non Sabbath Observant person to pour the wine and touch the wine, which cannot be done with non-mevushal wine. The other question I get often get when discussing mevushal is, does the process ruin the wine? Well based upon anecdotal data many believe that the correct answer is – it depends upon who does the process and when they do it. Herzog Winery and Hagafen Wine Cellars have a long track record of successfully creating wine that can last for years even after having been mevushaled. The rest seem to fail because they mevushal the wine at bottling time, which is pure suicide. The safest time to do the mevushal process is while it is still wine must. Many wineries in France “boil” their must, as it supposedly removes unwanted green flavors that come from the French terroir. With all that said and done, I use a simple rule of thumb that Dr. Daniel Rogov advises (the leading wine critic of Israel and kosher wine as well) drink mevushal wine 6-12 months from the time of bottling. 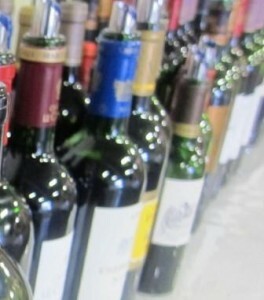 After that, red wines start showing pronounced cooked fruit flavors; while white wines just go belly up. Again, Herzog, Hagafen, and some Welner wines last longer than 12 months, but for all other mevushal wines, please follow the 6-12 month rule. Beyond the human interaction, kosher wine producers must be wary of the compound used to seal a barrel and the glue used in composite corks. Further a kosher winery must carefully clean down a bottling line before they can use it to bottle their wines. Finally there is the extra concern around the labeling; including the need to make sure the proper supervisory organization symbols are correctly printed! Kosher Wine is a pain in the behind to make and keep Kosher, but that does not stop wineries from making some exquisite wines that just happen to be Kosher! If you have kept with me this far I think it is only fair to bring this whole subject back full circle. If the wine is mevushal, there are no problems, anyone can open the bottle, pour it, or touch the opened bottle. Also, anyone can touch a person’s glass with the mevushal wine in it. A bottle of non-mevushal kosher wine that is corked and sealed with a closure, yes those annoying little dollops of wax on top of the cork also act as a closure, stays kosher. The state of kosher for a bottle of wine does not change as long as it stays sealed the way you bought it. Once it is opened, the game is afoot! and the open bottle and wine can only be handled by a Sabbath observant Jew. Some say that information is king but in the end it is all about the scores and the wines. So to fill that need, I have compiled a list of mevushal and non-mevushal wines that I have tasted these past few years. You can always fine more wines on my blog.